Interviews with a wide range of SaaSCloud company executives and Customer Success Management leaders and practitioners over the past two years have revealed significant changes in the CSM role as it has developed. From a beginning handful of companies, each with a solo contributor or two, to a large corporation with currently more than two thousand people assigned to the role, the acceleration in numbers and responsibility levels has been swift. And it’s far from over. 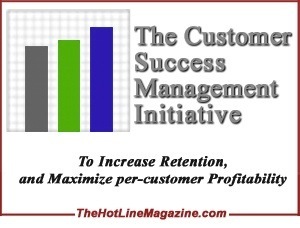 The Customer Success Management Initiative was begun in 2011 to gather data and to report on the continuing process of development of the role in the industry. The ongoing research will consist of online surveys, continuing direct interviews with CSM leaders and practitioners and the senior management teams of their companies and review of published material. The focus will be on the Strategy, Process, People and Technology of the CSM role, and the relationships between these elements in current practice. The results will be shared in articles here on The HotLine Magazine, white papers, monthly TCSMI Updates, formal Reports and Briefings, and in conference presentations and webinars. Currently sponsored by companies like InsideView, Gainsight (formerly JBara Software), Scout Analytics and Totango, the research of the Customer Success Management Initiative is an exploration of what technology companies are actually doing now, and/or planning to do in the near future, with their Customer Success groups and programs. Whether you already have established a CSM group, or are still in the planning and design phase, the questions and conversations of the CSM Initiative offer an opportunity for you to take a fresh look at how your company perceives a Customer Success Management program. Both strategic and tactical issues are explored. The first phase of the research involved two versions of an exploratory survey instrument, one for companies still in the planning stages of their CSM program, and the other for companies who have already established their teams. Reports of the findings have been shared with the participants of The CSM Forum gatherings and in the conversation of the Forum’s LinkedIn group, webinars and with Research Members of The HotLine Magazine. While full identification is required from all participants in the CSM Initiative research, both so that we can share the results with you and to assure accurate data, strict confidentiality will be maintained at all times. Neither your identity nor your specific answers to any question will ever be shared with anyone under any circumstances; only aggregate data will be used for reporting. 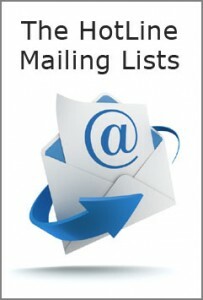 Be sure to sign up for the mailing lists to receive the monthly news briefs about research trends and events. You can also join in the discussions in the Customer Success Management Forum on LinkedIn, where CxO’s and practitioners provide different views and ideas about the emerging profession. The primary driver for establishing a CSM role, according to the developing picture from the research, is a concern over the customer retention rate. 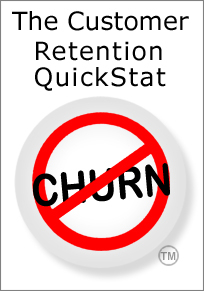 One of the problems in this area is that many companies lack accurate and usable data about their retention rates and the departure drivers that can cause churn. Even defining how to measure retention can be an issue: Is it by company/customer? Fluctuations in the number of seat licenses? By overall revenue and/or profitability? Where is churn likeliest to occur in the overall pattern of a customer relationship with a vendor? Where are the stress points? What constitutes an “at-risk” relationship? The Customer Retention QuickStat was developed to help companies develop actionable answers to these and other significant questions about customer retention. For more information about what a CR QuickStat could bring to your company, please contact Mikael Blaisdell.